Search Engine Optimization can be super confusing. There is a ton of information out there, and most of it is contradictory or outdated. 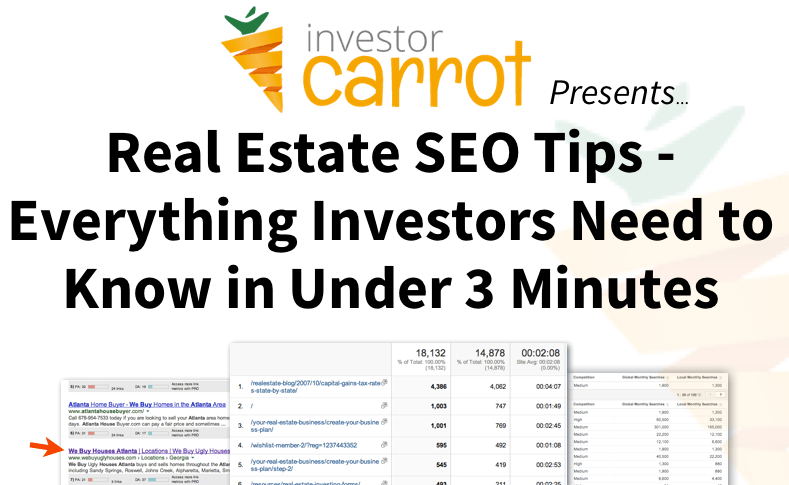 This video will help you break down in less than 3 minutes SEO tips for real estate investors. Don’t rush! 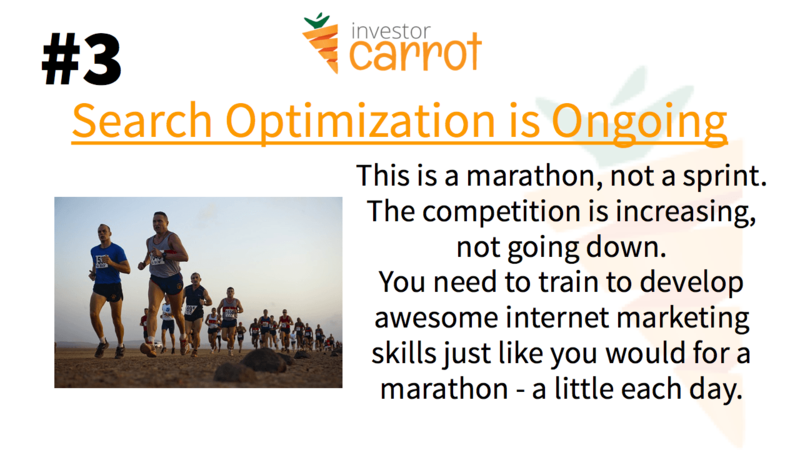 SEO isn’t a short term solution. It’s a long term investment in your business. So be patient… and make plans to get leads from other sources (we can show you how, no worries). 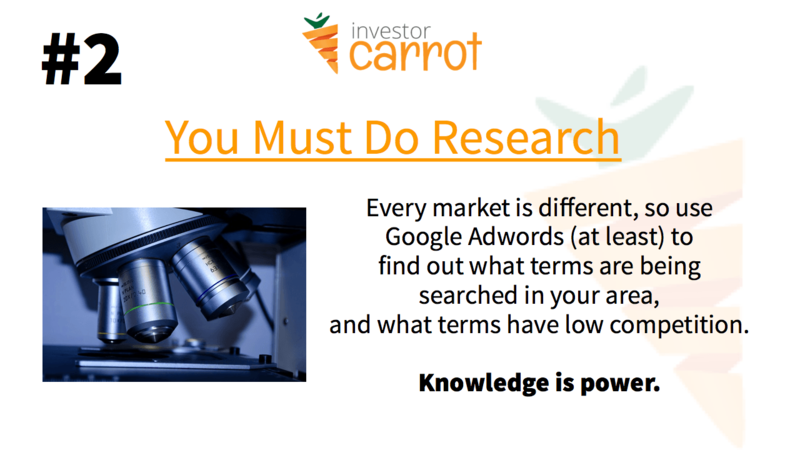 Our biggest Real Estate SEO Tip is to Do Your Homework… you have got to know what keywords are being searched in your market and understand what it will take to beat your competition – otherwise you won’t get the results you want. 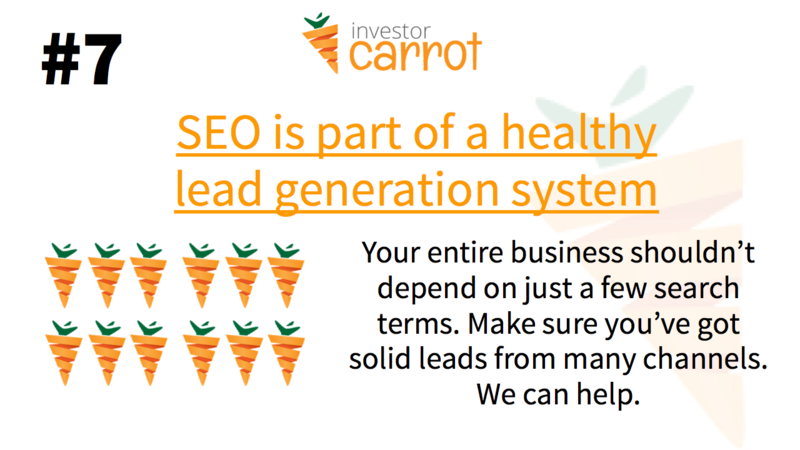 Get your Free SEO Bible here. 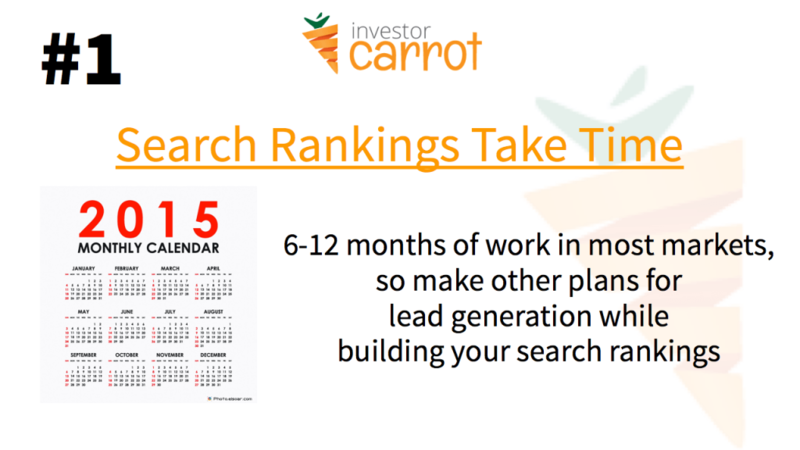 Keep on truckin… doing a little bit of SEO work every day (or at least a couple hours a week) will pay off well over the course of a year – if you’re focused and stick to a good plan (we’ll help you learn exactly what you need to know). Google has, like, the smartest people ever working on this stuff. If you wanna try and beat ’em, go for it… be prepared to suffer the consequences. We’d recommend sticking to a solid, proven content marketing strategy – not cheap tricks. Get a free real estate marketing plan template. Credibility matters more than almost anything else. 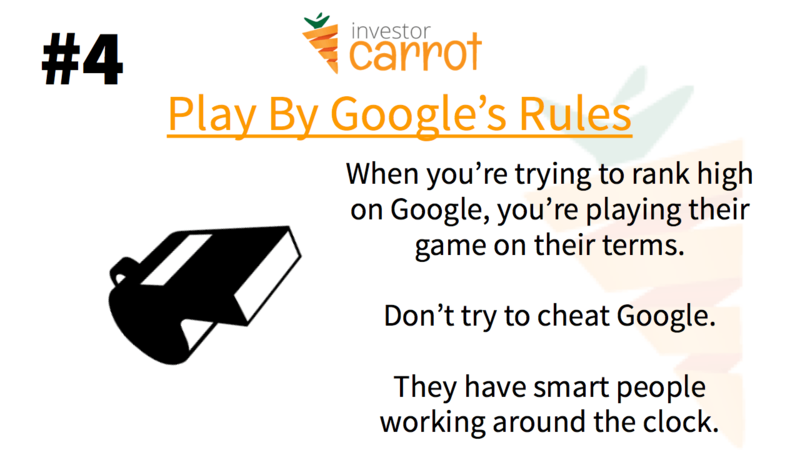 Once you prove that you (and your website) have Authority with Google, you’ll find it way easier to get high rankings on additional terms (and generate more leads). A focus on building Credibility for your business will improve your conversions on your site – add testimonials for social proof, improve your bio, and share your site in as many places as possible! Don’t buy those crummy spammy “instant result” automated SEO services – we’ve seen investors waste thousands of dollars and loads of time, just to find out they need to spend a lot more money on cleaning up the messes that were left behind. Seller intent keywords such as sell my house fast Dallas have much more quality searches for you than say, “what’s the value on my home?” Focus on high quality and you’ll get high-quality results. Our trusted vendors can help – click now to get started. Make sure you’re driving traffic to your website with at least a few different methods. Think of it as diversifying your marketing portfolio – so if one method crashes (when Google changes their algorithm some sites drop their rankings like a bad stock when the market is tanking), you won’t be left high and dry. 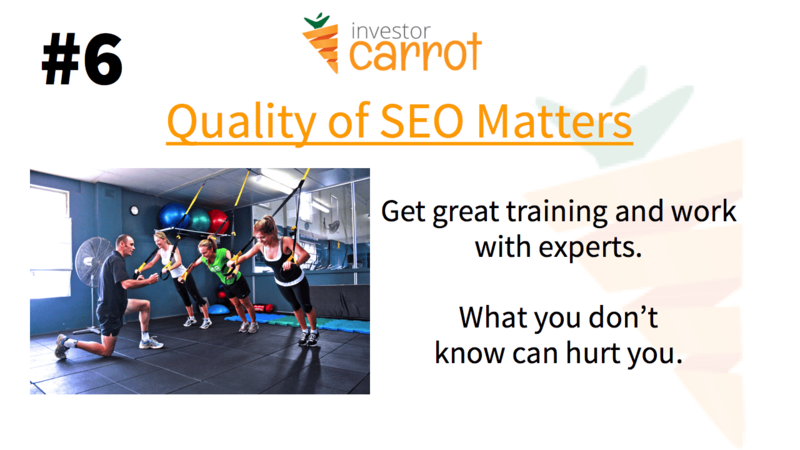 If you’re an expert in SEO, congrats! You’ll find our platform will save you a ton of time. 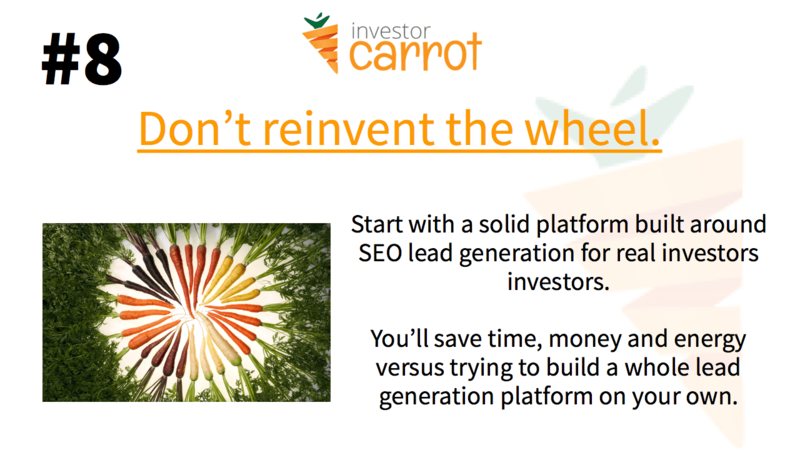 If you’re just starting out on your internet marketing journey, you will want to stick with a proven, tested platform that helps you generate leads… oh hey, that’s what we built! 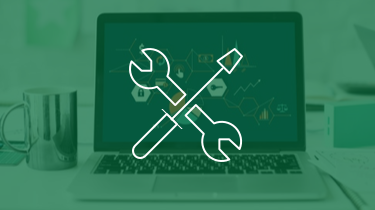 ;) Launching a website on our platform takes less time than you spent to read this blog post – click here to see how fast it is to get started. 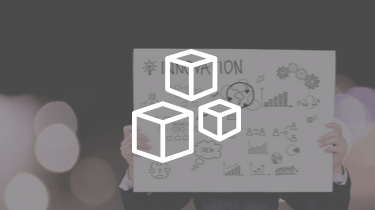 Get access to a free demo of the InvestorCarrot technology platform! 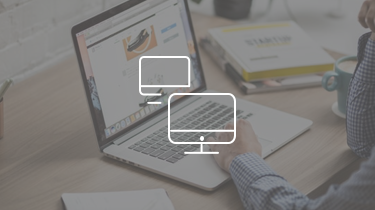 Want to learn more about content marketing, lead generation and SEO? 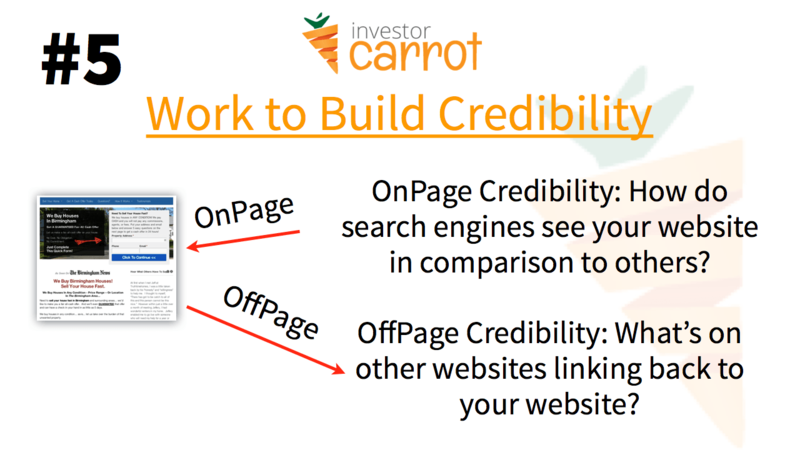 The majority of search traffic comes from page 1 – these terms are highly competitive, so it’s super valuable to invest in good SEO in your local market. We can help you. Click to see Brittany’s story of going from zero online leads to multiple leads per day – and how she was able to quit her wage job to become a full-time investor working for herself. The SEO training was awesome and content packed. I really appreciate the help you provided.